Migration watch; 07.25 - 12.45hrs. 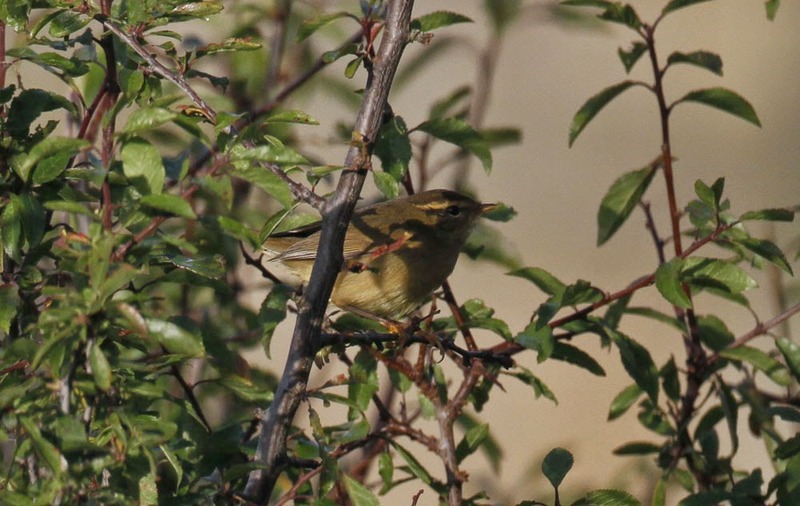 The highlight of the day relates to some very late news from the 17th October when a RADDE'S WARBLER was photographed on Castle Hill, only Scarborough's second record, no doubt it would have proved popular if it's identity had been recognised sooner. On the move (south unless stated) were 14 Red-throated Diver north, 6 Gannet + 95 north, 3 Cormorant + 3 north, 1 Whooper Swan, Pink-footed Goose + 20 north, 2 Common Buzzard north, 1 Merlin north, 1 Snipe, 6 Curlew north, 138 Little Gull north, 20 Black-headed Gull + 11 north, 19 Common Gull, 54 Kittiwake north, 7 Arctic Tern north, 2 Auk sp + 826 north, 43 Skylark, 7 Meadow Pipit, 23 Rock Pipit, 3 Alba, 1 Blackbird, 3 Starling, 4 Tree Sparrow, 1 Chaffinch and 14 Linnet. Elsewhere 6 Whooper Swan were still near the Flask Inn, the 3 Scaup were still present on the Mere, a record 74 Mandarin (50+) drakes were on Hackness Lake along with 6 Teal and 3 Tufted Duck. At Wykeham South Lake there were 47 Pink-footed Geese, an adult Mediterranean Gull was at Scalby Mills and the probabl blythi Lesser Whitethroat was in Crook Ness.